Radio Silence lets you keep a list of apps that aren't allowed to go online. The firewall is invisible and always active. You don't have to keep any windows open. Safe 30-day guarantee: If you’re not 100% happy, you get your money back. No questions asked. Works with macOS 10.10 and newer, including Mojave. It is perhaps the easiest firewall I've ever used. 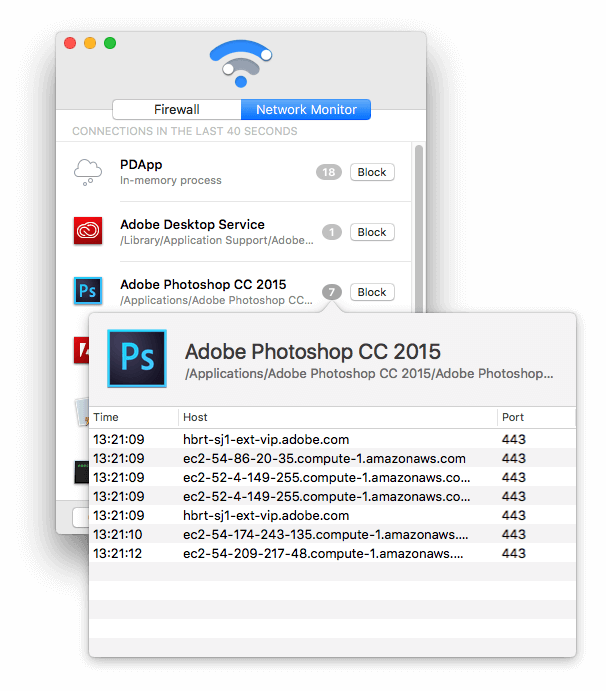 Did you know that when Photoshop launches, up to 7 different processes connect online? Radio Silence’s network monitor shows you every network connection in real time. 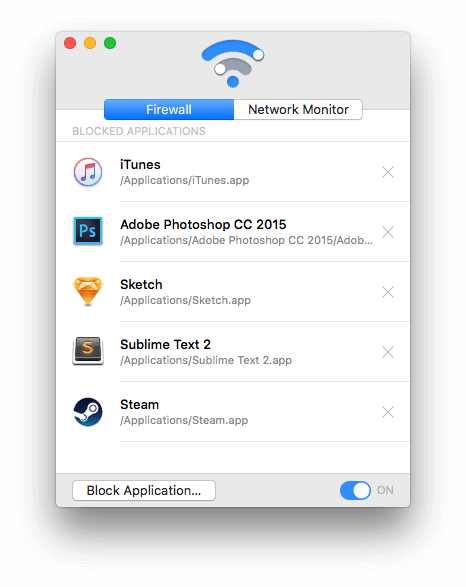 If you find a misbehaving app, you can block it with a single click. A lot of apps secretly check in with the mothership behind the scenes without asking your permission. If you'd prefer they didn't, Radio Silence can solve your problem hassle-free. Do other firewalls get fan mail? Radio Silence is truly an app for the Mac. Simple and elegant. I switched from Little Snitch and it's been wonderful! I just bought Radio Silence and love it! It does exactly what I was looking for! Thank you again for a fantastic product! This app is awesome and easy to use, thank you! I love your app Radio Silence. It's great in the same way Apple-made apps are great: fantastic minimalism, great interface, no-nonsense. Radio Silence is built on years of real-world experience and customer feedback. Instead of making you twiddle with settings, it simply does the right thing. A hassle-free, and cheaper, alternative to its cousin Little Snitch.